Reese Witherspoon is riding high on an Emmys wave. 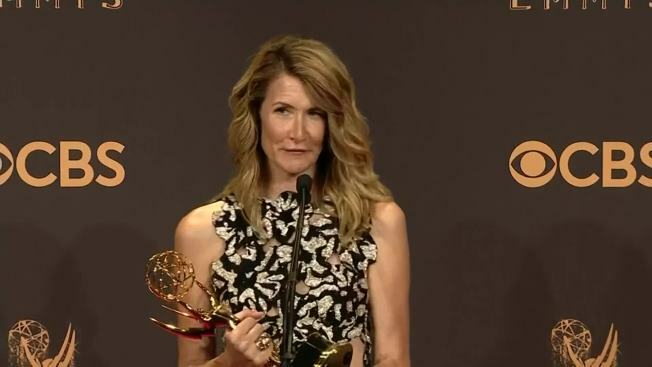 The actress, who was nominated for her acting work in "Big Little Lies" and took home an Emmy for her role as executive producer on the HBO miniseries, took to the stage with a message of female empowerment and continued that message at the after parties. "I want little girls out there to know that you can be the architect of your own story, you can be a storyteller, you can be a director, you can be a writer, you can be a producer, you can be anything...And I want to put those stories forward and I want women to see that together we are unstoppable," she said. Witherspoon's co-star and fellow executive producer Nicole Kidman took home the Outstanding Lead Actress in a Limited Series or TV Movie, Laura Dern won for Outstanding Supporting Actress in a Limited Series or TV Movie and Alexander Skarsgard won in the Outstanding Supporting Actor in a Limited Series or TV Movie for their work in "Big Little Lies." Jean-Marc Vallee won for directing the acclaimed series. Witherspoon has been open about the possibility of continuing "Big Little Lies," but only if it's right. "Oh, I hope so. We'll see. It has to be fantastic though because I like things to be really good," she said about the potential of a second season. "I'm not going to even start until it's really, really good." "Big Little Lies" was based on the book of the same name by Australian author Liane Moriarty who has gone on record saying she's thinking about ideas for a follow-up to the successful series. Original Post: Reese Witherspoon Hopes Big Little Lies' Emmys Wins Help Girls Know "You Can Be the Architect of Your Own Story"